Sorry I’m so late getting this weekly recap up on the blog. I know that several of you guys were running in the Inaugural Star Wars – Dark Side Half Marathon Weekend last weekend. Following along on social media made me wish so much that I could be there. 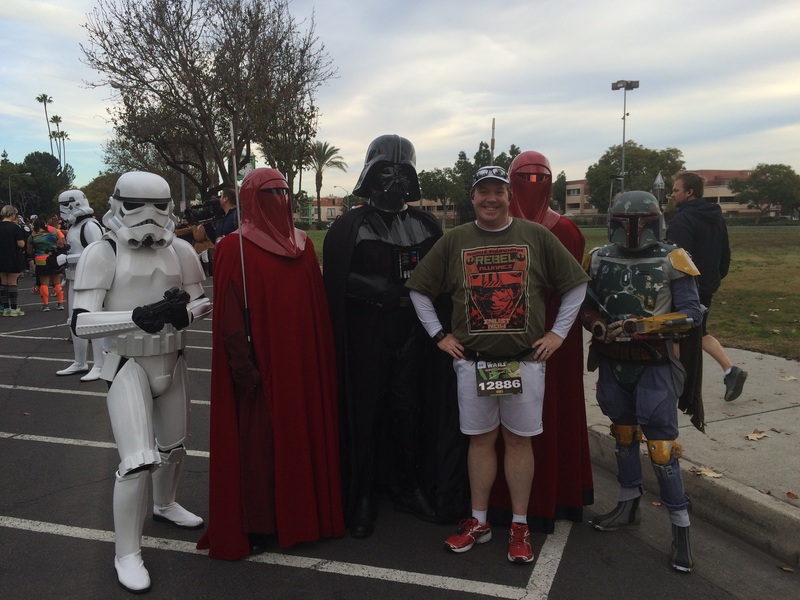 It had me reminiscing about when I ran in the Inaugural Star Wars Half Marathon at Disneyland in January of 2015. Good times indeed. 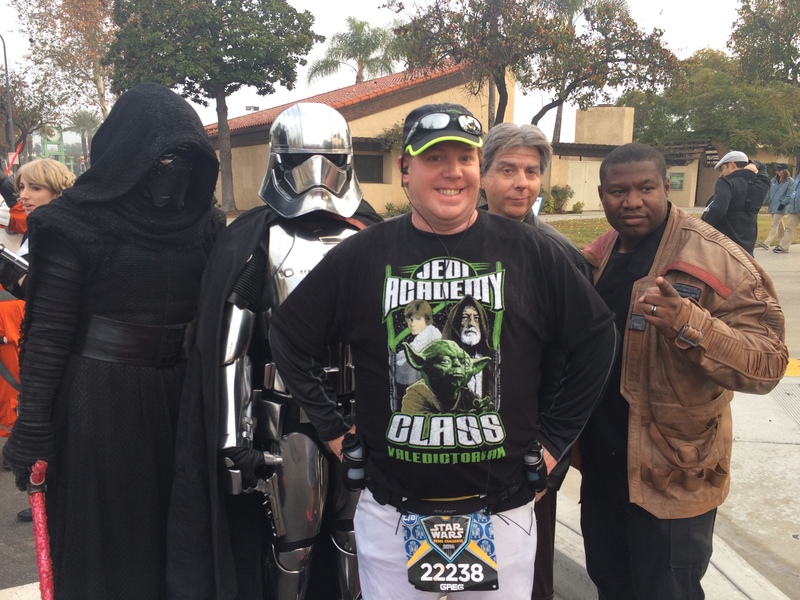 Of course, the 2016 Star Wars – Light Side Half Marathon was just as fun this year as it was the year before. 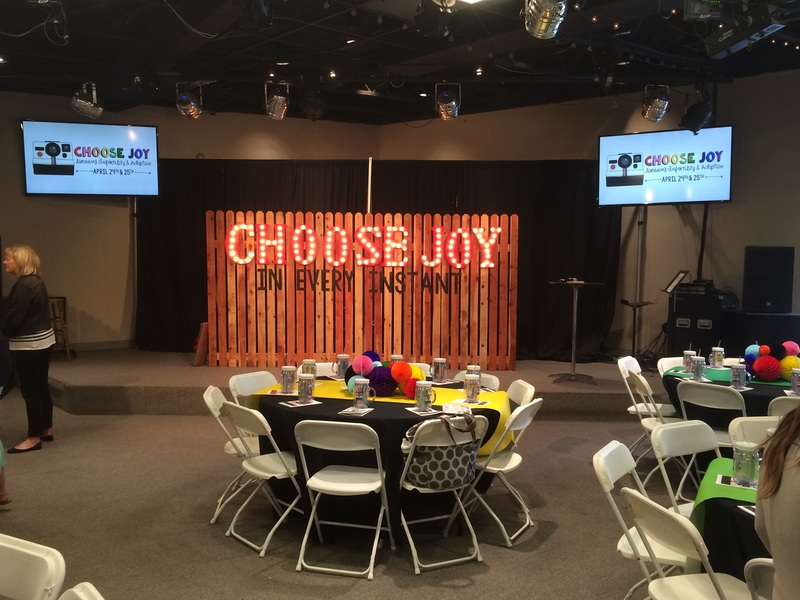 Another event I got follow along with on social media was the Choose Joy Conference. Brooke and I had registered for this conference and is why I didn’t sign up for the Inaugural Star Wars – Dark Side Half Marathon weekend. The above picture is from last year’s Choose Joy. Unfortunately, I didn’t get to go this year. Why? Well, even though my wife and I are not talking a lot about this on social media yet, I feel like I need to make a brief mention here because it will make a lot of what’s going on in my running life and the inconsistent blog posts make sense. On March 22nd, Brooke and I brought home our son. We were chosen to adopt the most amazing little boy ever! Currently, we are not talking about this on Facebook. Since my Facebook and Twitter accounts are linked, if you follow me on Twitter or are Facebook friends with me, please don’t mention this news on those social media accounts. When we are ready to go more public, you’ll know. I’ll likely do a blog post. Of course, there will be details that will not be shared online. But, I will get around to posting pictures and give a few more details in a post dedicated to my boy and his arrival. So, now I’m a running daddy! It’s been a crazy new season of life. I’m not complaining one bit. Life as a dad is awesome! However, as any new parent will testify, it’s also a season of less sleep. So, I’ve been working on convincing myself that my life as a runner does not need o end in this new season of life. Last Tuesday (April 12th), I got out on my first training run in this new season of life. The goal for the run was merely to see how it felt to be running again. I had run the Angels Baseball Foundation 5K on the Saturday before this. It was a huge confidence boost. However, running after a full day of work and less sleep was a totally new challenge. 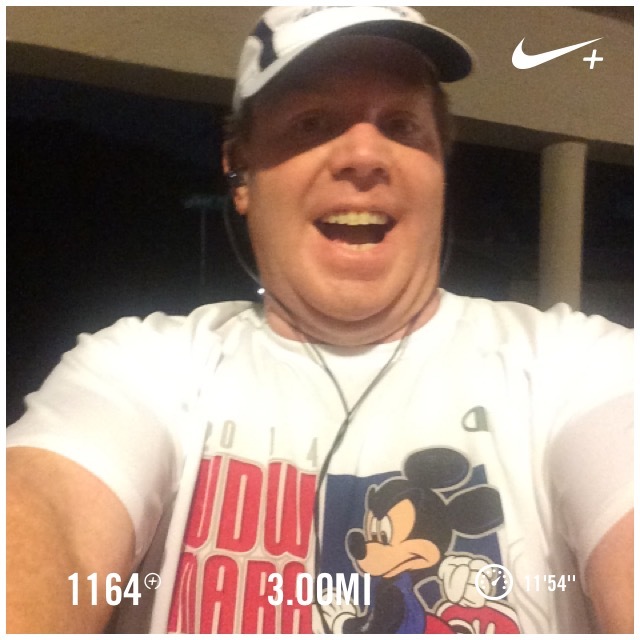 I went with a run 30 seconds, walk 90 seconds run/walk interval on my 3 mile route. I decided not to push too much. I will not be running the Rock n Roll San Diego Half Marathon due to the expense of staying in a hotel for the race. So, since I’m not training specifically for this race, I could take a step back and take time to adjust. On this run, the first mile went pretty well. I finished in under 12 minutes! Honestly, I had no idea what to expect. I was just going with the flow for this run. I felt really good in that first mile! It felt great to be running and that I wasn’t completely wasted. I was running well. Life was good! Mile 2 was a little harder, but I was still going good. I was just over 24 minutes at the end of mile 2. I briefly thought about changing the intervals in the last mile. However, I was enjoying the intervals and being back on a mid-week training run. So, I decided to just keep it at 30/90. The easier elevation in the last mile helped a lot. I finished just under 36 minutes! A sub-12 minute per mile average felt amazing! I can do this! I can be a running daddy! So, Thursday, I made it back out again! 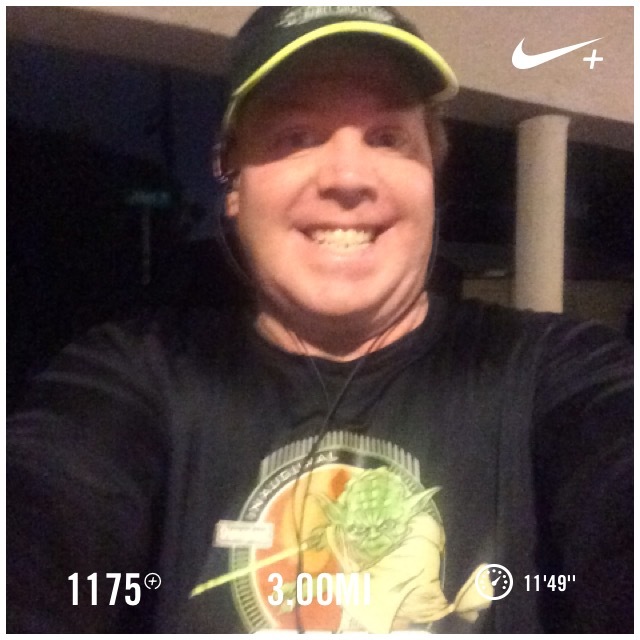 With the Star Wars Dark Side Half Marathon Weekend events starting up on that day, I had to wear a Star Wars shirt. You know what I mean? Anyways, I kept the same intervals as Tuesday because I wanted to build on what I did Tuesday. Success! Mile 1 was finished in around 11:40! I was faster than on Tuesday! I kept that momentum going on into mile 2. I was a couple seconds over 24 minutes at the end of mile 2. However, I was still a little faster than on Tuesday. So, I was running mile 3 to see how faster I’d be. I ended up around 15 seconds faster! It’s not much. But, I’ll take it. I did not make it out for any kind of training over the weekend. What can I say? The weekend got away from me. I realize that I’m still a work in progress. However, the results this week were encouraging. Life is different now. It’s nice to know that I can still continue along this running journey. There will be better weeks than this one. I can’t wait to see what this new season of life brings! Can’t wait until I get another 10+ mile training run under my belt! Congratulations on becoming a dad! It’s so lovely to hear after reading previously about how long you had been waiting! What a blessing! Congrats! how awesome! A new runDisney running buddy! Congratulations! Welcome to the parent club! So, so, so much YAY!!!!! I was hoping that is what was happening. Your life will never be the same. Enjoy every minute of it! Congrats! So incredibly happy for you and Brooke!